Organic. A refreshing alternative to milk. Great taste 2014. Gluten and dairy-free. No added sugar. Suitable for vegans. Vegetarian Society approved. Kosher - KLBD.We're all about the oats Ever since we mixed our first porridge, we've been a wee bit obsessed with oats. We loved them so much, we turned them into a drink. 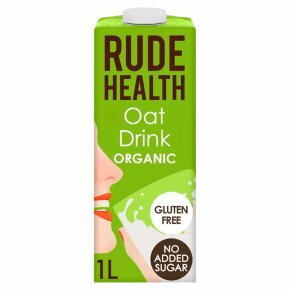 And because oats have their own natural fats, they blend into a rich, creamy alternative to milk. How we like it Drench Rude health gluten free Honey Puffed Oats. Enhance the oatful plenty of porridge. Use liberally for lighter pancakes, curries and cream soups. Pumpkin soup happens to be extremely oat-friendly, but it's not alone. Hungry for more ideas?